If you missed the CMAs last night, no worries! For the third year in a row Blake and Miranda won it all. Honestly it doesn’t bother me- they are just the cutest together! Carrie and Brad hosted for the 3rd year and were adorable as always. Most importantly Carrie changed looks 12 times. 12! I LOVE IT! I can’t wait to host an awards show and have a new look from top to bottom every 3.5 minutes! Since I am the biggest country fan I had to do a post on Carrie and her always right on point looks. 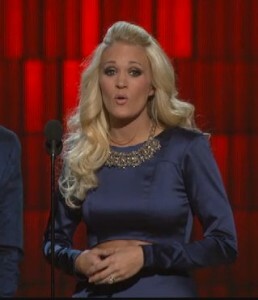 I appreciate Carrie because not all the country stars have the best style. But our girl has come a long way from being on Idol to being an Idol. This is what Carrie looks best in to me. Gold and White. She looks like a goddess. Complete perfection! 1. Side shot of her Red Carpet dress – boom! LOVE!!!!! 2. Red hotness dress ,Chagoury Couture, is gorgeous on her figure. She looks like a little Christmas present. 3. OBSESSED WITH HER “BLOWN AWAY” DRESS!!!! Nothing like singing your face off while your skirt flies in the air. True Diva moment! 1. This Ines Di Santo looked haunting. Incredible. That slit up the leg almost stopped the show! 3. This was the least favorite of all the dresses Carrie. Even though I’m a huge Christian Siriano fan I would have liked this dress to have had more color. I would have really enjoyed seeing her in a yellow or hot pink gown. 4. Again the “Blown Away” dress. Just being fierce. I mean rhinestone gloves! She walked out and you could almost hear the audience gasp. She was giving us abs, and legs. Seriously, this Sally La Pointe dress was beyond flawless! And of course must show you the cover of Carrie’s new single “Blown Away.” Carrie really does know how to carry off grey which is such a hard color. What was your favorite looks? Tags: Carrie Underwood, CMS, country, Country Music Awards, Fashion, host, red carpet, redcarpet fashion, style. Bookmark the permalink. carrie underwood is my favourite singer.she looks gorgeous in red dress.